One of the fundamental challenges with today’s networking is that we use an IP address for two unrelated purposes, as an identity AND as a location. Tying these together restricts a (virtual) machine from moving around as easily as we would like. We had the same challenge with telephony before wireless came of age. . . our phone number rang for us at a specific destination rather than following us wherever we went! Also, VMware is pushing to make VXLAN a standard, and had broad network industry support, including from Cisco, Arista, Broadcom(s brcm), Brocade(s brcd), Emulex (s elx) and Intel (s intc). More information about the technology is available on Herrod’s blog, as well as on the group’s IETF submittal. VMware has yet again won the hearts of its clients because of regularly updating and upgrading their features and services. Your comment about OTV being limited Layer 2 is incorrect. OTV is meant to extend L2 over L3 (IP) networks. Your comment about OTV being limited to a Layer 2 environment is incorrect. OTV is meant to extend Layer 2 over Layer 3 (IP) networks. 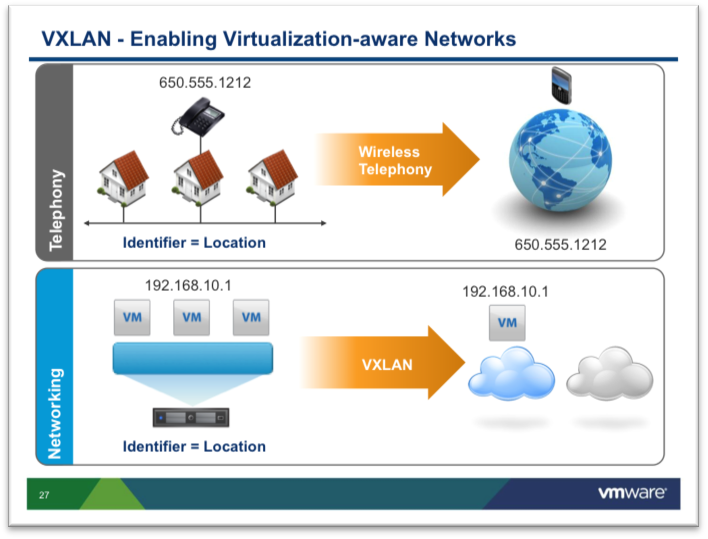 Cisco VXLAN white paper has a section on VXLAN vs. OTV and LISP. This is nothing new, though. Companies like vCider ( http://vcider.com ) are offering this as a service already. And contrary to a vendor specific solution, you can actually set up networks that span different cloud, from different providers (EC2, Rackspace and machines in your data center all on the same LAN). Yes, but it is non-standard. This is isn’t new indeed, but the relevant thing is that it comes from the biggest virtualization player and networking player together, and it comes as IETF standard proposal backed by other vendors (incl. Citrix, not mentioned on the article).